Quite a few years ago now, I had an epiphany. I realized there were just TWO simple chores I needed to stay on top of to ensure I felt really good about the state of my home. Guess what they are? You’ve got it! Dishes and laundry. I’m betting those two tasks are always at the BOTTOM of your list. How do I know? Because they’re everyone’s LEAST favorite jobs. Even if you don’t mind doing them when you’re actually in the act, the thought of catching up on laundry or dishes is just like…UGH. Right?? And here’s why: instead of doing a load of laundry and running the dishwasher every day, it gets put off. Then, when it’s time to catch up on laundry or dishes, the whole process is an exhausting, all-day affair. Who wouldn’t dread that? The good news is, it doesn’t have to be that way! The better news is, you can create a laundry routine and a dish washing routine, so it all becomes automatic and simple. The BEST news of all? 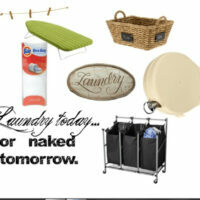 Always staying ahead on laundry and dishes will make you feel like you have a handle on your entire list of housework! Awesome! Here are the real life laundry solutions you're looking for! 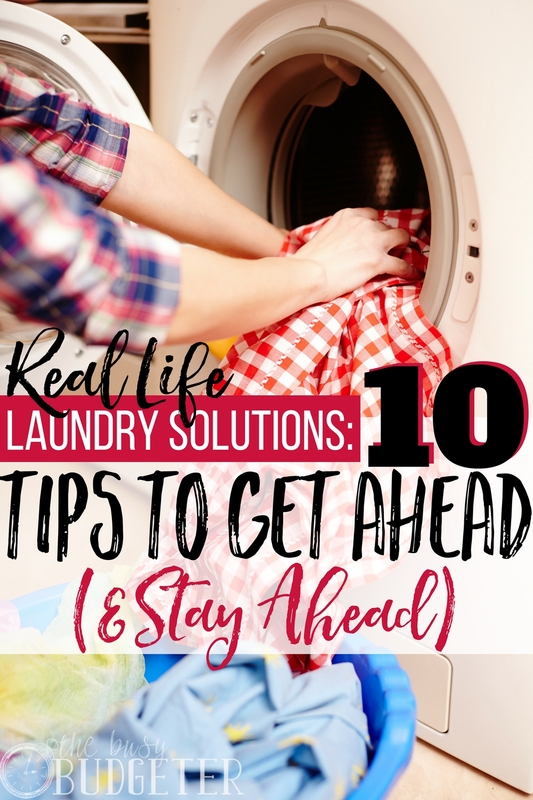 Staying ahead on laundry is pivotal to a less-stressed life! When you don’t have clean clothes, you end up wearing things that make you feel less confident. You end up skipping your workouts because your sports bra is dirty and you don’t have any socks. You end up saying “no” to plans because you don’t have anything to wear…or you end up going out and buying clothes you don’t need because it’s easier to spend money than to catch up. It’s also really hard to relax when you’re behind on laundry. Even if you start to read a book or watch a movie, there’s that nagging feeling that you’re avoiding a task rather than actually spending quality time enjoying your relaxation. Avoidance and procrastination exacerbate stress! Even when you're taking a break, you might feel like you can’t fully embrace it because you know you really should be doing laundry. So it’s time to get ahead and stay ahead on laundry. YOU CAN DO THIS! We’re going to build new habits to help you conquer that laundry heap. You’re going to set yourself up for success by keeping that laundry pile under control! Here's how to make laundry easier…MUCH easier! I know. You’re thinking, “Did I read that right? Did she say DAILY? !” Yes. The first step to real life, actual laundry solutions: doing one load a day. For a family of four, that one load is enough to keep up with everything. That one load is going to set you up with clean clothes and make you feel like you’re totally on top of it! If you have a bigger family, you might need to do more laundry. If you’re single or it’s just you and your spouse (but you’re still constantly behind), I want you to still commit to doing a load of laundry every day—at least until you build up the habit. So calculate out: do at least one load of laundry, but possibly two (if you have a larger family). Most of us can get by doing just one load of laundry per day. 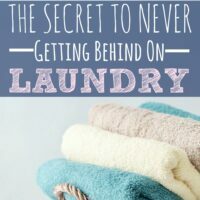 Once you’ve made it through the 28 days, if you REALLY feel like you’re doing tiny loads of laundry, you could stretch it to a regimented every-other-day, but if you want to make it stick, never have more than one load of laundry outstanding. Also, keep in mind, if you skip a day or feel like taking a break, it can throw off your habit and you’ll be off routine. Instead, keep powering through! If, and only if, you don’t have a washer, so you have to go to the laundromat: then, you can make laundry a weekly routine. Avoid the temptation to stretch out your laundry routine longer than a week. Most of us don’t have enough towels and clothes (or the room to store) more than a week’s worth of laundry. When we avoid the laundromat until we have weeks and weeks of laundry piles, it’s absolute misery. It’s more than we can haul to the laundromat, scrounge up quarters for, fold, or deal with all at once. We continue to put it off because it's a huge ordeal. So if you hate going to the laundromat and you don’t have the option to do laundry anywhere else, I want you to make it FUN. Get a magazine or book you’re dying to read. Alternate with your spouse who goes and who stays home with the kids. Create a “laundry playlist.” Do whatever it takes to make it fun to do laundry (or less terrible). In the meantime, start saving for a washing machine and keep an eye out on Craigslist. Look through your schedule and pick a regular time you're going to throw in a load of laundry. It could be right before you make dinner, it could be in the morning right when you get up, or it could be when you let the dog out. Whatever your routine, find three minutes (it actually takes less) to put in a load of laundry. Then, find a 30-second window (literally, that's all it takes) to switch the laundry over to the dryer. Maybe this is right before you dry your hair, right when you get out of the shower, or right when you’re cleaning up dinner. Last, you’ll need to find six minutes (again, it can probably be even less—for real) to fold and put away the laundry. So, altogether, less than 10 minutes of your day (!) is going to be spent on laundry. TOTAL. When you have only one load to wash, that's all the time it takes. Getting the motivation is the most challenging part. The rest is simple. Like I said, you can totally do this! For most of us, we can keep up with a ten-minute daily task without needing help. Is it fun to be the sole laundry-lady in your house? Not so much, but trade off for another chore and you might get out of cleaning the toilet forever! Put a timer on your phone to go off when you need to switch your laundry. If you really want to see if it takes less than 10 minutes (I swear it does), then you can also time yourself, just to see. You may also want to put a reminder on your calendar while you’re building the habit of doing laundry. It can be easy to become rushed and think, “Meh, I’ll get to it later.” So set it on your calendar and stick to it. I want you to stick with doing just ONE load of laundry a day. If you’re very behind right now, you might be tempted to “clear the slate” by doing a whole bunch of laundry to catch up. If you do that, tomorrow you’re going to feel like you deserve a break (because you’ll be sick of laundry). If you do ONE load a day, within a week or two you’ll be totally caught up and in a regular routine. Do bigger loads for now, then eventually you can go with small easy-to-dry loads once you get caught up. Narrow down your towels and sheets to just two per family member. Each person needs only two towels: one to dry off with for about a week, and then another to switch out while that one gets washed. You can color coordinate them for each person or just mark them with a sharpie in the corner. Same thing with sheets: just two sets for each bed. When you wear something like a sweater or a dressier outfit, you don’t have to wash it every time. Hang it back up when you take it off and wear it later. You can also wear jeans a few times before they need to be washed. Resist the urge to toss clean clothes in the laundry just because you don’t feel like hanging them back up! I know it doesn't sound like an important item on this list of laundry solutions, but it’s HARD to find motivation to go into a creepy basement or haul laundry around in a dilapidated basket. Plus, it's kind of ick when your dirty clothes go in a basket…then you use that same basket for clean clothes when they come out of the wash. Instead, use washable bags to sort your laundry. Pick laundry soap with a smell you enjoy. Look for a few ways to spruce up your laundry area. It doesn’t have to be magazine-level beautiful. Just somewhere you won’t dread the (LITERALLY) 10 minutes a day or less you’ll be spending on laundry. Once you’ve made it through 28 days, laundry should feel like more of a regular thing. You may also notice a difference in your overall house and maybe even your stress levels as well. When you feel like you’re up on chores and they aren’t hanging over your head, life feels much easier and more relaxing. Don’t fall off the wagon. Now that you’ve caught up on laundry, stay on it! Don’t let it pile up. If you happen to miss a day, recommit the next day and keep going. Staying ahead on laundry can transform your whole outlook on housekeeping. You don’t have to have a perfectly clean house or everything spotless, but keeping up on laundry (and dishes) makes a huge difference! Try these laundry solutions and watch that pile of laundry shrink! Great tips, Rosemarie! 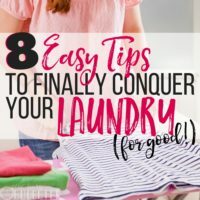 I especially love the tip about creating less laundry. My husband and I use the same towels for about a week, but my kids use the same towels for about 2 weeks because they shower less often than we do (about 2x a week rather than every day or every other day like I do). Also, we tend to wear certain clothes more than once before we wash them. Jeans for example – have you ever noticed how much more comfy jeans are the second day after they have stretched out a bit? That way we only have one or two pairs to wash rather than 6 or 7. Really reduces the loads (and water use)! Heather @ Made In A Pinch recently posted…Three homemade popsicle recipes! I’m definitely one for creating less laundry, if possible. 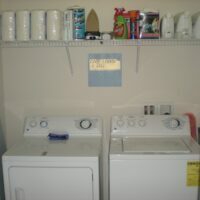 Also, decorating makes the laundry room more inviting and encourages you to want to do the laundry. Now I want to go decorate my laundry room! These are great ideas! I have to have a fresh towel each shower, but will definitely be trying some of these tips! Thanks! For the last week and a bit I’ve been doing a load of washing every day. I’m also breaking up some of my weekly washing, like towels, and doing them on a Friday night after work rather than in the weekend proper. It’s amazing what a difference it makes, and it also means everything is clean and dry and ready for my Sunday afternoon ironing session (which I do while watching Grey’s anatomy as a treat!). We have an altogether different way of doing things here in my part of the world, but the tips were very motivating. Thanks, Rosemarie. I am glad to hear that I am not the only one that does one load of laundry every day! In my house, this is the only way that I can keep up with my family’s laundry. If I don’t keep up with that routine, I am overwhelmed with laundry during the weekend. I really loved your tip about using the towels more than once! I definitely will be using that tip.This will save me at least a load of laundry a week. Great tips as always! Thank you! one load of laundry every day! In my house, this is the only way that I can keep up with my family’s laundry. Great suggestions! I’ve played around with doing 1 load of laundry per day, but I never get it folded and put away. Then it’s just a frustrating pile! I’m going to try this for 28 days and see how it goes. Here are the latest and working SiteGround Coupons of 2019. Get up to 70% OFF.